A replica of Zavok appears as the first boss of Sonic Forces, and is the first one to be faced with Modern Sonic. While the Avatar is infiltrating the Prison Hall, Sonic is released from his prison by Zavok with orders of executing him by jettisoning him into outer space. Due to the Death Egg losing power at that point, Sonic's restraints break, allowing him to rebel against the red Zeti and initiate the battle. The battle takes place on a multistage platform in the middle of the cell room, with many captured civilians watching on in the battle in jail cells. 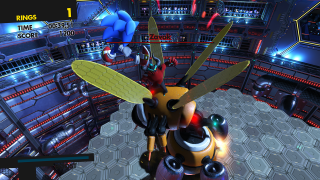 Throughout the fight, Zavok rides on top of a giant Buzz Bomber-like robot known as the Death Queen, and is out of reach from Sonic's attacks. In the first stage of the fight, up to three groups of Rings appear, and Zavok summons three Buzz Bombers to attack Sonic, which must be destroyed to proceed. After that, the Death Queen will fire lasers from its legs, followed by a swarm of Buzz Bombers that will attempt to dive bomb Sonic. Following those attacks, the Death Queen will attempt to smash into the arena with its stinger to attack Sonic. When the robot does this, Sonic must move out of the way while standing on the floor to be launched upward into the air, and from there he can strike Zavok with a barrage of Homing Attacks to damage him. Sonic must not jump when the Death Queen slams the floor, or he will miss his chance to attack Zavok and must repeat the wave of attacks again. After landing two hits on Zavok, the second phase of the battle begins with parts of the platform breaking apart, leaving less room for Sonic to stand on, with more waves of Buzz Bombers being summoned to attack Sonic. This time, the Death Queen will begin attacking directly by charging at Sonic with its stinger, which must be avoided twice. Zavok will then attempt to crush Sonic with the Death Queen's stinger again. At this point, Sonic must avoid the attack and repeat the processes of Homing Attacking Zavok two more times until Zavok is down to his last hit point. At that point, Sonic will automatically jump onto the Death Queen and deliver a beatdown on the red Zeti, taking out his last hit point and ending the fight. ↑ Sonic Forces Original Soundtrack - A Hero Will Rise, Disc 1, Track 16 - "Battle with Death Queen"